PE is a common consideration in patients with chest pain, dyspnea, or cardiac arrest. We have had increase in CT use for PE disproportionate to increase in PE. Ultrasound has advantages over CT such as no radiation, use in unstable patients, no contrast needed that can damage kidneys. Prior studies have shown that ultrasound findings of right heart strain, subpleural infarcts, and DVT can be used to help diagnose PE; however, each alone is not sensitive enough to rule out PE. This study aims to see if combining these tests into a single “multi-organ” scan would have a better sensitivity for PE. How accurate is an ultrasound of the heart, lungs, and veins in diagnosing PE compared to CT? Can ultrasound be used to create a diagnostic algorithm that would reduce CT and not lead to missed PE? Lung - 4-8 MHz linear probe or 3.5-5 MHz curved array probe. Long and oblique scans on anterior and posterior chest in supine position. Lateral decubitus or sitting for dorsal areas. Looking for subpleural infarcts. Also noted consolidations, effusions, interstitial syndrome. Heart - 2-5 MHz phased array probe. RV dilation with one of the following: a) right to left ventricular end diastolic diameter >0.9 in apical 4 chamber of subcostal b) RV end diastolic diameter >30 mm in parasternal view c)Thrombus in right side of heart. Effusion and dissections were noted also. Vein - 4-8 MHz linear probe. Short axis of common and superficial femoral veins, popliteal veins. DVT = absence of total vein collapse during compression. Considered positive scan if any of the three was positive. 1. 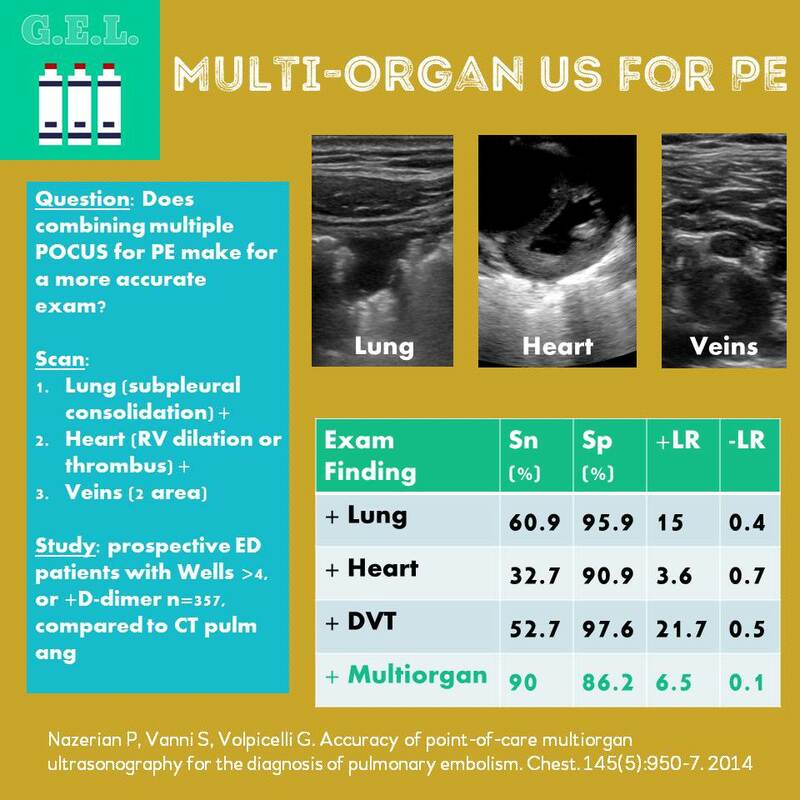 Multiorgan Lung ultrasound is feasible and better than single organ scans to rule out PE. 90% sensitive, -LR of 0.12.